tl;dr: If your company makes mobile phones and your company isn't Samsung or Apple, then we wish to extend our deepest sympathies for your pitiful share of profits. That's right; just two mobile phone companies rake in 99% of the profits. According to mobile industry analyst Horace Dediu, the split goes 73% for Apple and 26% for Samsung. He says this reflects a market disruption, with a growing number of users transitioning from feature phones to smart phones. To compete in this new market, phone makers had to change their approach to design, manufacturing and marketing. Following Horace's reasoning, two of those companies have simply done a better job of changing, effectively and efficiently. And it's not hard to see how, since among all phone makers only Samsung and Apple can claim nearly full vertical integration; they control all aspects of manufacturing and supply, via ownership or preferential contracts. 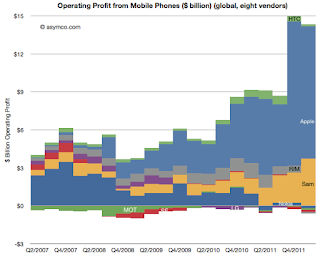 ...[recent quarterly statements seem] to imply a dearth of profits in an industry that is, by all measures, booming. Units are up 7% with smartphones up 47%. Revenues are up 20% and overall profits are up 52%. This are exceptionally strong numbers. Few industries can measure growth in double digits. So if the industry is booming but the majority of participants in the industry are loss making (and surprisingly so) then what is going on? There are two answers: new market disruption and low end disruption. The new market disruption is the migration of a large number of demanding customers away from phones-as-voice-products to phones-as-computing-products. The low-end disruption is the migration of a large number of less demanding customers from branded phones to unbranded, commodity phones.